Last night, I watched Governor Mike Pence and Senator Tim Kaine participate in the 2016 Vice Presidential Debate. This debate was held in Virginia, where Mr. Kaine is a US Senator. Overall, I think both did a good job. I was expecting the debate to be uneventful, but obviously the candidates were prepared to thrust and parry. As this debate followed the 1st Presidential Debate and Secretary Clinton is still leading in the polls, I think Senator Kaine was in a more difficult position. Specifically, he needed to make sure that he did not allow any conditions to arise that would result in undecided voters to change course if they were leaning towards the Clinton-Kaine ticket. As to Governor Pence, I think his focus was to shore up the Republicans who have been on the fence with regards to voting for Donald Trump and attract some of the undecided voters. Governor Pence was successful at associating the rise of ISIL/ Daesh to President Obama and Secretary Clinton’s withdrawal of American troops from Iraq. Considering Islamic Terrorism is happening quite frequently and accelerating in the West and around the globe, it is hard to understand the premise behind Senator Kaine’s statement that we are safer than we were eight years ago. Senator Kaine was successful at painting Governor Pence’s position on abortion as counter to federal law, and worse controlling of women’s rights. At the same time, Governor Pence did not deny or beat around his position being driven by his faith, Evangelical Christianity. 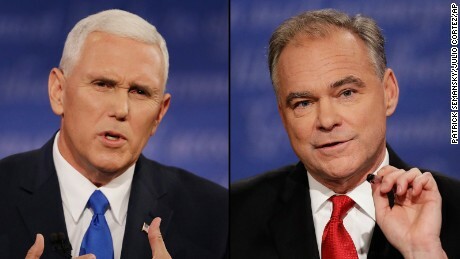 Considering what both needed to accomplish, I think Governor Pence’s sticking the blame of the creation of ISIL/ Daesh to the current administration was quite damaging to the Clinton-Kaine ticket. Senator Kaine tried spinning the Iran Nuclear Deal (JCPOA) as a short term success, but most of the US and the World feels it was overall a bad deal that will lead to a nuclear Iran 10-15 years (similar to North Korea, but with money and support from Russia and China). So where Secretary Clinton should have shined, in terms of her most recent experience, the take away is that her foreign policy picture is less than stellar (closer to abysmal). The subject of Pro-Life/ Pro-Choice may have backfired as it likely helped Governor Pence shore up the Republican evangelicals who were on the fence regarding Trump. I strongly doubt anyone who is a single issue voter in terms of Pro-Choice, LGBT rights or other progressive positions was realistically considering the Trump-Pence ticket. Considering both presidential candidates are in their 70s, the public got a good picture as to who the running mates are. Which may be important as their partner might not run for re-election in 2020, or might experience a life-threatening illness which would result in the VP becoming President. In summary, I feel most of America saw that the Clinton-Kaine ticket still has their heads in the sand when it comes to Islamic Extremism; worse they don’t recognize the failed policy is partially culpable for the last eight years of death, destruction and proliferation of hatred. I don’t like Donald Trump, but I can’t stomach supporting another 4 to 8 years of head in the sand stupidity.